It’s time to let go of the Eggo for good! You need “real” waffles. And, these Amazing Belgian Waffles are perfect. They’re not only delicious, but healthy. No oil. No dairy. No eggs. Vegan and low-fat! By now, it’s pretty obvious I love breakfast. It is my favorite meal of the day. And, I also love waffles. Who doesn’t? But, let’s admit it. They ain’t the healthiest things in the world. So, I felt the need to do something about it. 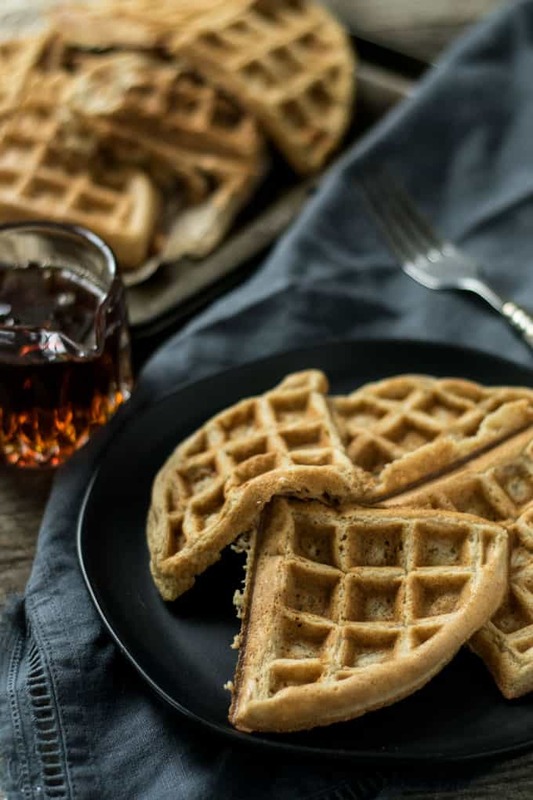 I’d love to tell you I spent hours experimenting and testing waffle recipes. But, I didn’t. I just took out all the crap and used healthier options. In place of eggs, flax. For sweetener, maple syrup. Unsweetened almond milk instead of dairy. And, since I never use oil in my recipes, unsweetened applesauce worked just fine. For the batter, I used a mixture of whole wheat flour and oat flour. I tend to like my waffles a little more “hearty” than fluffy. And, the combination worked perfectly. Don’t have oat flour? No sweat. Just throw some rolled oats in a blender and grind them up until you see flour. If that’s still too much trouble: 1) You’re lazy. 2) Just use whole wheat flour. I chose to use a Belgian-style waffle maker because I like my stuff thick and big. I also like the characteristics of a Belgian-style waffle. The crispiness around the edges and a little fluffy and chewy everywhere else. Awesome! But, any waffle iron will work. Use what you got! 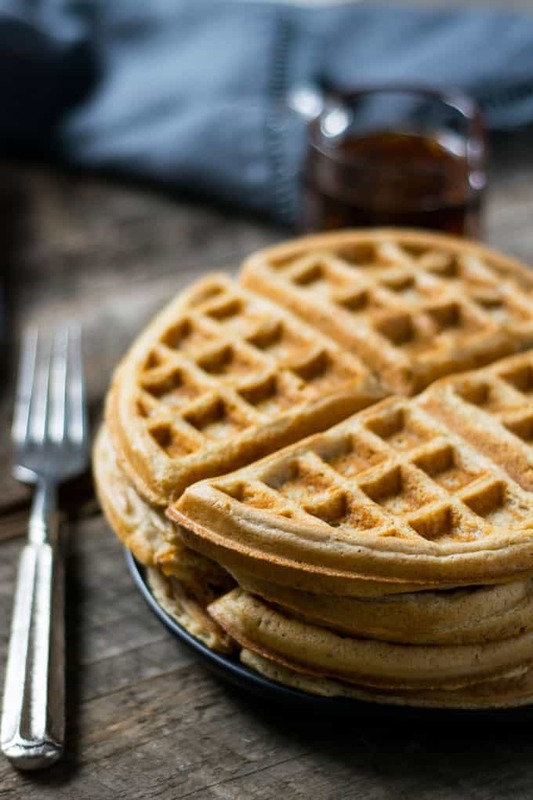 If you really want to up your breakfast game, pair these waffles with my Spicy Vegan Breakfast Sausages or Smoky Maple Tempeh Bacon. These amazing Belgian waffles are so boss, you’d never know they were vegan and healthy. They’re also low-fat, super simple to make, and absolutely delicious! So, enjoy. 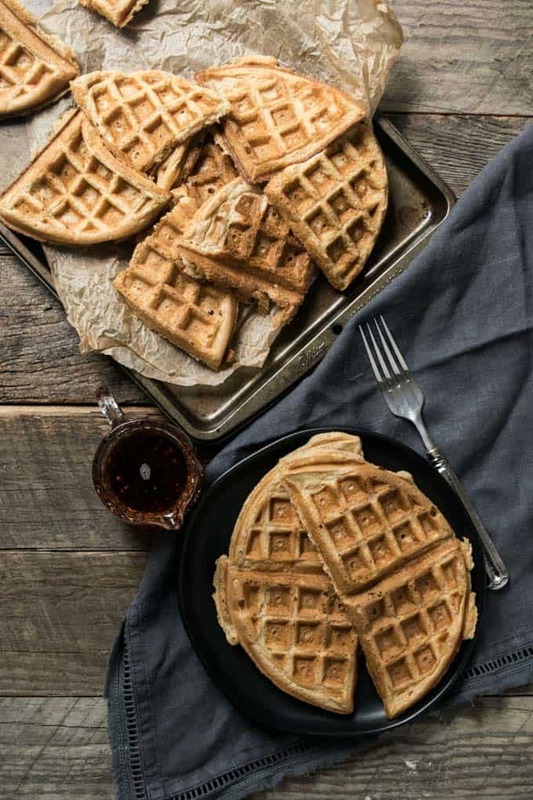 These Amazing Belgian Waffles are perfect for Saturday morning breakfasts. They're not only delicious, but healthy. No oil. No dairy. Vegan and low-fat. Make flax eggs and put aside allowing it to set up for a few minutes. In a large mixing bowl sift together flour, baking powder, and salt. Add in applesauce, maple syrup, flax eggs, and milk. Whisk until all ingredients are well combined and make a smooth batter. Let batter sit for about 5-10 mins. Pour about 1/2 cup of batter onto the waffle iron. Cook until waffle is golden brown. Continue until all of the batter is gone. Make your own oat flour by adding 1 cup of old-fashioned rolled oats to a blender and processing until fairly fine. Home. Run. I love these things and don’t feel horrible afterwards. Delicious. Susanne, thanks so much for the kinds words and the question. Honestly, I use whatever I have in the pantry at the time. I made these with whole wheat flour, but the pastry flour would do just as well. I specifically used whole wheat for the recipe because I feel that is more accessible for people and more of a “non” special item. Hope this helps and good luck! Peace. Made these for family this morning and they all asked for seconds! Yummy! Sandra, thanks so much for sharing. So glad they enjoyed them. I am so glad I found this recipe. 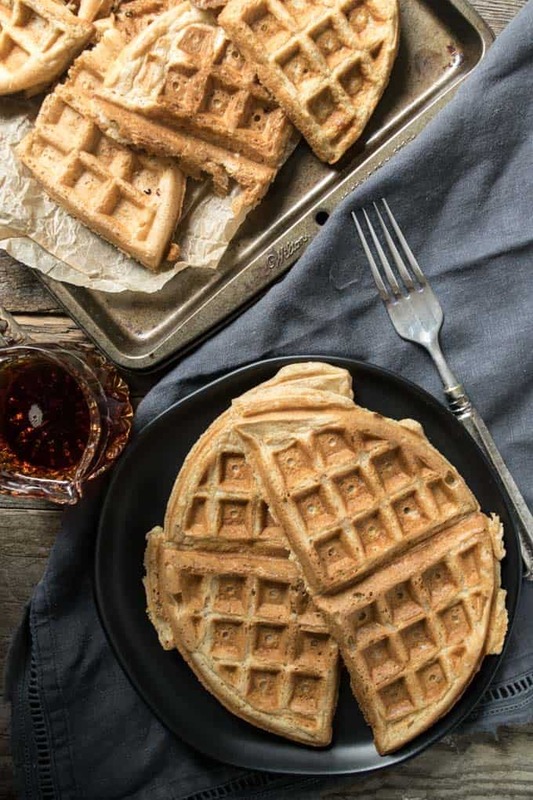 It is hard to find a waffle recipe that is vegan and oil-free that doesn’t contain a bunch of weird ingredients. I almost had everything on hand. I did just run out of oats so I used all whole wheat flour and i didn’t have any almond milk but I did use my homemade hemp milk. They turned out great and both my two year old and 12 year old loved them. Thanks for the awesome recipe! Erica, so glad you enjoyed them. And, way to go and improvise. I love reading these types of comments. Way to make it your own! Peace. Thank you for developing and posting this recipe! These were a hit with my 15-year-old son. They also freeze well and can be popped in the toaster to reheat and eat. Amazing with fresh sliced peaches! Emily, thanks so much for your response and pumped your son liked them. Sounds great with the peaches. Can’t wait to try them that way. Blessings! These waffles turned out INCREDIBLE, thank you so much!! Kristin, that’s great! So glad you enjoyed them and thanks for reaching out. I really appreciate it. Peace. I really love overnight yeast based Belgian waffles – just not the butter, eggs and milk. I think I will swap out the baking powder and give it a try. Will report back. Made these for breakfast this morning, and OH MY GOODNESS! Crispy, light, and delicious! I topped mine with a sliced banana and homemade blueberry syrup. These will definitely be going in the breakfast rotation. Thank you, Shane, for another delicious recipe! Awesome, Jennifer! Thanks so much for sharing and pumped you liked them. Peace. 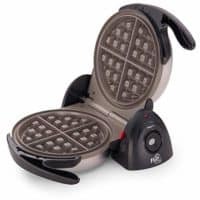 They taste yummy, but they split in half every time I was taking them out of the waffle maker, not sure what I did wrong. I looks like they are empty on the inside, LOL. The only thing different is that I used soy milk instead of almond, any suggestion for my next batch? Thanks for the recipe. Yes, sometimes mine come apart at the seams. I don’t think the type of milk should matter. Try adding a little more flour to make the batter a little thicker. That might help. Good lukc!!! I made these today…. This is the FIRST whole food, plant based pancake or waffle recipe I liked. It is wonderful! Thank you for sharing this!